Dear Sir, Craven Street, April 10, 1774. In compliance with your request, I have endeavoured to recollect the circumstances of the American experiments I formerly mentioned to you, of raising a flame on the surface of some waters there. 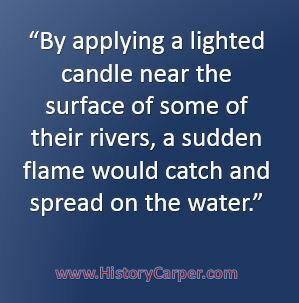 When I passed through New Jersey in 1764, I heard it several times mentioned, that by applying a lighted candle near the surface of some of their rivers, a sudden flame would catch and spread on the water, continuing to burn for near half a minute. But the accounts I received were so imperfect that I could form no guess at the cause of such an effect, and rather doubted the truth of it. I had no opportunity of seeing the experiment; but calling to see a friend who happened to be just returned home from making it himself, I learned from him the manner of it; which was to choose a shallow place, where the bottom could be reached by a walking-stick, and was muddy; the mud was first to be stirred with the stick, and when a number of small bubbles began to arise from it, the candle was applied. The flame was so sudden and so strong, that it catched his ruffle and spoiled it, as I saw. New-Jersey having many pine-trees in different parts of it, I then imagined that something like a volatile oil of turpentine might be mixed with the waters from a pine-swamp, but this supposition did not quite satisfy me. I mentioned the fact to some philosophical friends on my return to England, but it was not much attended to. I suppose I was thought a little too credulous. In 1765, the Reverend Dr. Chandler received a letter from Dr. Finley, President of the College in that province, relating the same experiment. It was read at the Royal Society, Nov. 21. of that year, but not printed in the Transactions; perhaps because it was thought too strange to be true, and some ridicule might be apprehended if any member should attempt to repeat it in order to ascertain or refute it. The following is a copy of that account.